Leicester-based architect rg + p was tasked with designing a development of 68 affordable eco-homes in Saffron Lane, Leicester. 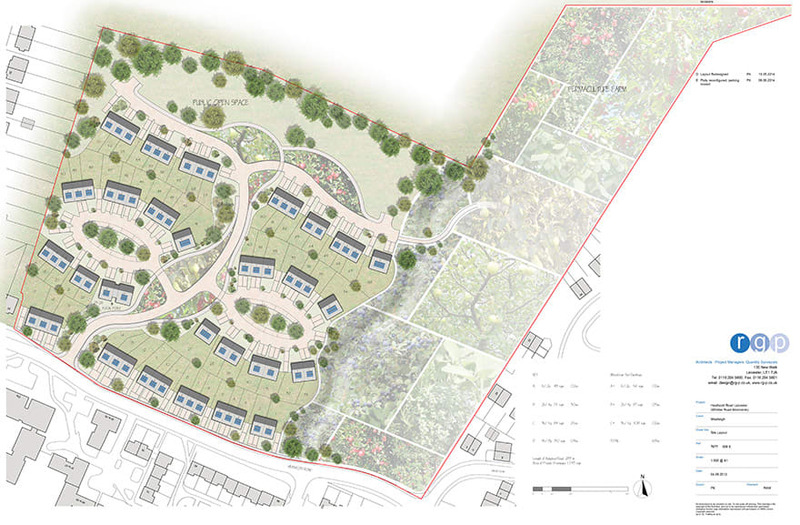 Previously a disused and overgrown plot of land, Leicester City Council worked in partnership with developer Westleigh, social housing and care provider emh group and Saffron Lane Neighbourhood Council (SLNC) to develop the 13.2-acre site. rg + p’s brief was to design a mix of affordable housing properties, from one-bedroom apartments to four-bedroom houses, to meet the needs of the local community. Eight of the properties are also wheelchair-friendly. The homes needed to be energy efficient and of high quality design. Another requirement was to create a development that would help to bring the community together. Next to the site is a permaculture farm and a community garden run by SNLC which provides funded work placements and volunteering opportunities for local people. Residents are invited to grow their own fruit, vegetables and supplies, helping to build stronger community ties and to encourage more sustainable living. rg + p worked closely with developer Westleigh to design the homes, which were built using timber frames and timber panels, manufactured offsite in Westleigh’s factory. All the homes were constructed using Westleigh’s sustainable timber framing, Westframe PassiPlus, and were built to Lifetime Homes Standard, making them adaptable to residents’ needs throughout their lifetime. Robert Grewcock, lead architect on the project, explains: “We have a long-standing relationship with Westleigh but this was the first Passivhaus development we have designed using Westleigh’s timber-frame system. “We employed a Passivhaus consultant throughout the project to advise us and to ensure that we met the strict criteria, while also keeping the housing affordable, scalable and low maintenance. This is the largest Passivhaus-accredited development in the UK. “ArchiCAD has a good library of components which helped us to develop initial design ideas very quickly. We were able to develop the initial site plan and house types within just a few weeks,” says Grewcock. The team combined every house type into a single master model. In addition, rg + p used ArchiCAD to create detailed street scenes and visualisations to help explain the concept and designs to the developer and the planners. Grewcock adds: “With ArchiCAD, we quickly created a visualisation to take to client meetings on a laptop, which we could then mark up following the feedback we gained. Once we had agreed the initial concepts, we designed one house in full detail and then rolled out the concept to the other properties, increasing the level of detail as the project progressed. With the help of ArchiCAD, this was very straightforward to do. rg + p designed the homes to take into account specific considerations for the Passivhaus design. All properties face south to maximise the warmth from the sun. Extra space was allocated for the mechanical ventilation heat recovery (MVHR) units and air ducts, with the service space located on the north side of the properties where the air is cooler. Effective collaboration and information sharing was essential throughout the project. rg + p shared IFC files directly from ArchiCAD with the Passivhaus consultant, who in turn could mark up the drawings to alter elements such as air duct sizes where necessary. In addition, the ArchiCAD models contained the BIM information that Westleigh used to manufacture the timber frame units. The homes were built in phases and completed in summer 2017. Using timber frame, Westleigh was able to construct the homes much faster than with traditional building methods in a quality-controlled environment, resulting in a more energy-efficient and cost-effective construction process. Every home was air tested and accredited individually to guarantee it met the Passivhaus standard. The homes are now being monitored for energy efficiency, and initial feedback from residents is very positive. The scheme has highlighted the benefits of sustainable affordable housing and will act as a positive role model to encourage similar projects across the country. Since completion it has won several industry awards including the Structural Timber Awards Best Social Housing Project 2017 and the SHIFT Awards (Sustainable Homes Index for Tomorrow) Best New Build Project 2017. A few comments. In many 'eco' homes the windows are slits, just like those in prisons. These here appear to be bigger. An opportunity to build a second floor was missed (architects don't get it, do they? ), instead of having a huge, sloping roof, which is very expensive to construct and fit. I see the awful driveways, complete with expensive, labour-intensive 'brickettes', will cost the owners a lot when they need to be cleaned, lifted, re-laid, etc, in future. The 1m brickettes used for Exhibition Rd in London took ages to hand-fit, very expensive to replace when underground works are (frequently) required, and their light colour is inevitably stained with the heavy oil leakages that vehicles eject.